The Young Lions competition was a unique and valuable opportunity for HelpAge to connect with young people on the issue of the world's ageing population. We want today's young people to realise that older people are fighting for a better older age for all – and that if they don’t join forces today to make a better world for people of all ages, what sort of world will today's young people be living in when they’re 60? We wanted the creatives to inspire today's youth into becoming campaigners to end age discrimination and fight for older people's rights. Age discrimination and ageism are tolerated across the world and we want to involve more young people in campaigning for a new United Nations convention which would make clear governments' responsibilities to protect older people's rights. About 40 teams, all under 30 years of age, from across the world were asked to create a film that would change people's perceptions and help young people understand that older people are fighting for a better older age for everyone. They had 48 hours to write, shoot and edit a video commercial of up to 60 seconds in length. By the end of the festival they had slept very little and were nervous and anxious as they awaited the result. The benefit to HelpAge was not just in the final product, but perhaps more important for me was the experience of working closely with young people from around the world and getting feedback from them. I made myself available to the teams to discuss their ideas. What transpired were deep conversations about their own connection with the theme of ageing. We talked about their relationships with grandparents and their own attitudes to later life, the increased value of some things as they age in contrast to lack of appreciation often faced by older people. It was sometimes shocking to hear young professionals admitting that they did not find the problems facing older people – and even their own eventual old age – relevant to them. Some found the creative process of coming up with ideas for their videos a chance to engage with their own blindspots about ageing. The process of filming opened many of their eyes to the presence of previously unnoticed older people around them everywhere. Led by Sir John Hegarty, founder of the London agency, Bartle Bogle Hegarty, the 22 members of the international jury took an hour to watch all 38 films. The winning video, produced by Spain was an ingenious work aimed at the knowing audience of advertising professionals which drew upon the stereotypical library images of happy fun loving older people which sometimes adorn advertisements but which do not reflect some of the problems faced by the older generation. The film was screened at the final awards ceremony later that evening in the Palais des Festivals. The cost to HelpAge was relatively small. For just under a £1,000, I was able to get to Cannes, book a modest hotel and feed myself – a small investment compared to the thousands of pounds worth of creative time put into the films by the young teams. 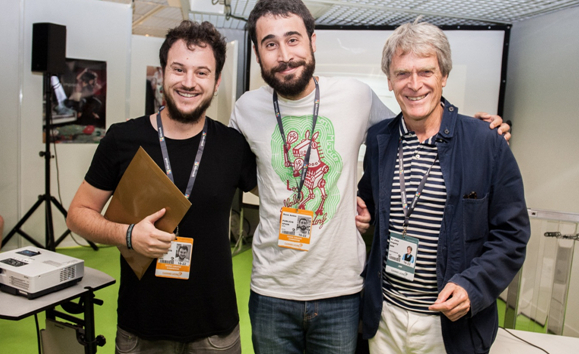 HelpAge is grateful to Cannes Lions for the opportunity to take part in the festival. We'd like to offer our warmest thanks to all of the young competitors who created incredible work and offered profound insights into the process of connecting young people with the important issue of ageing.Check out some videos of our experience.